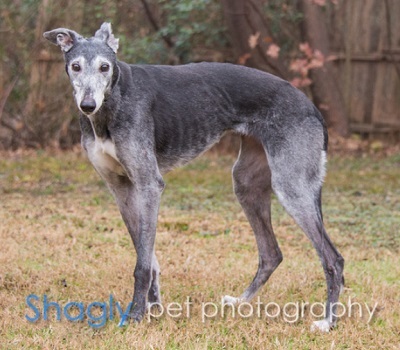 Rylee is a 10.5-year-old, beautiful black female born in April 2007. Her registration number is illegible, so her identity will never be known. Rylee was originally found as a stray wandering the streets of Dalhart, TX. Animal Control tried for 4 days and finally she was captured, obviously tired and worn out. 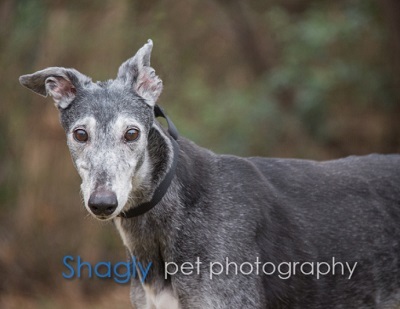 She was in a home for many years, but has returned to GALT due to no fault of her own. She is a quiet and somewhat shy girl. Rylee is cat tolerant. 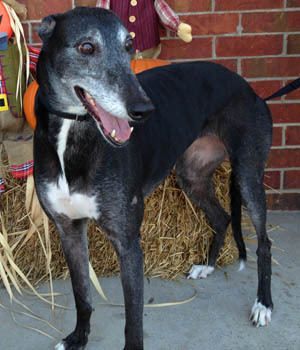 Rylee is a gorgeous, sweet, black girl with a lot of love to give to the lucky people who decide to adopt her. She is happiest when she is at home in her comfort zone. She absolutely loves long walks and running around in the back yard. Since she was picked up as a stray, Rylee was naturally quite shy when we took her into our home. However, she is gradually becoming more outgoing and plays well with our other three dogs. This raven beauty is versatile enough to enjoy the company of humans of many different ages! She gets along well with our 11-year-old daughter and her girlfriends – and she also enjoys hanging out with our 19-year-old son and other teenagers. Since Rylee has no problems with our doggie door, we no longer feel the need to crate her. She has quickly learned the house rules and holds her own with the rest of our menagerie! While Rylee has not been officially “cat tested” by GALT, she has had the occasion to meet a couple of cats. Rylee showed no interest in these cats, so it’s possible that she may be cat-trainable. This beautiful girl is just waiting for YOU to meet her. We know you’ll love her as much as we do!